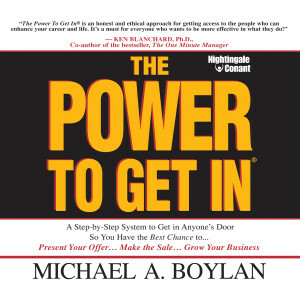 Michael A. Boylan is the founder and CEO of Strategic Access Systems™, a training and performance consulting firm. He developed and used THE POWER TO GET IN® system to gain access to the presidents of some of this country’s largest corporations, including General Motors, AT&T, ITT, Prudential, RJR Nabisco, American Express, Citicorp, Johnson and Johnson, Paine Weber, Time-Warner, Shell Oil, USX, and many others. He is also the founder of two other successful companies, including Automated Telemarketing Services, Inc., which markets predictive dialing systems and call processing networks throughout North America and the United Kingdom.